Maxim Russia: "Gays We Respect." 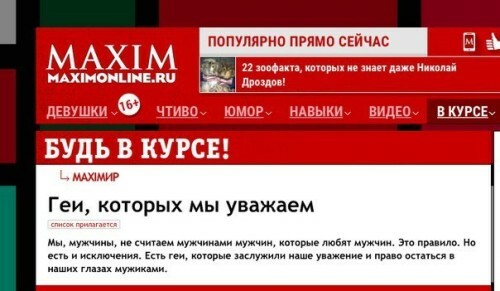 The Russian version of Maxim magazine Russian has “forgiven” a handful of gay male celebs for their sexual preferences. These so-called “exceptions” include British actors Stephen Fry and Ian McKellen, singer Freddie Mercury, writer Oscar Wilde, and American celebrity Neil Patrick Harris. “Our position is clearly formulated in the introduction to the article,” the magazine’s editor told Buzzfeed.